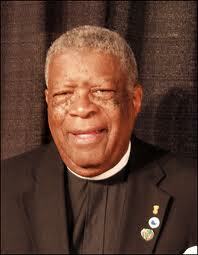 The Reverend Canon Nelson Wardell Pinder, Sr. was born in 1932 in Miami, Florida. He grew up in the Liberty City neighborhood of Miami and was baptised and confirmed in the Historic St. Agnes Episcopal Church. After serving in the Army in the Korean War, he earned a Bachelor’s Degree in Philosophy from Bethune-Cookman College. He later earned a Master’s Degree in Education from Florida A&M University. Inspired by the work of young Episcopal priests working in urban ministries, he received a call to the gospel and decided to attend Nashotah House Seminary in Wisconsin. In 1959, he was called to Orlando, Florida and began his service as the first full-time priest of color at The Episcopal Church of St. John the Baptist. During the 1960’s, he became known as “the Street Priest,” organizing and participating in sit-ins and protests which helped to advance civil rights in the city of Orlando. In 1969, he was installed as a Canon, and was assigned to The Awareness Center, where he served for three years. As Priest of The Episcopal Church of St. John the Baptist (1959-1969, 1972-1995), Father Pinder enjoyed many accomplishments. He led the church the through building of two sanctuaries (1963 and 1990), and led the church through the process of obtaining Parish status in 1985. Father Pinder retired from St. John the Baptist on December 31, 1995, where he served a total of thirty-three years. He returned to St. John the Baptist in 2010 to serve as Interim Rector, and led the church through the purchase of our new Heissler pipe organ. He has served in many diocesan and national positions in the Episcopal Church, most notably as the fifteenth National President of the Union of Black Episcopalians. He currently serves as the Chair of the Anti-Racism Committee of the Diocese of Central Florida. He has been vice chairperson of the Joint Commission on the Church in the Small Community and vice chairperson of the National Commission on Social and Specialized Ministries. He received an Honorary Doctorate from Virginia Theological Seminary in May 2010. In August of 2007, “Pinder’s Kids,” an original play by Central Florida actor and playwright Barry White, celebrating Father Pinder’s civil rights legacy, premiered at The People’s Theatre. On April 9, 2010, the “Pinder’s Kids” monument was dedicated at Parramore Heritage Park in Orlando. Father Pinder is a life member of the Alpha Phi Alpha Fraternity, Inc. and has served the Orlando chapter as Chaplain, President, Vice President, and as chairperson of many of its committees. On January 9, 2010, he was honored at a special service held at the Cathedral of St. Luke, celebrating the fiftieth anniversary of his ordination to the Priesthood. Father Pinder has been married for over fifty years to the former Marian Grant, of Jacksonville, Florida. Father and Mrs. Pinder are the parents of two children, Gail (deceased) and Nelson, II (Janet), and the proud grandparents of four.